You will find life a lot easier if you take time to study the art of asking a girl out. That does not mean trying out all the suggestions you get from friends and colleagues, who will be only too happy to share their ideas. Every female is different, and you need to take the time to get to know her personality as well as her likes and dislikes, before you progress to asking her out. It will take time to get to know her, especially if she is reserved, or a very private person. 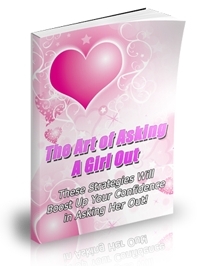 This EBook will provide you with practical advice on how you can get to know her and convince her to go out with you.